Help Now! 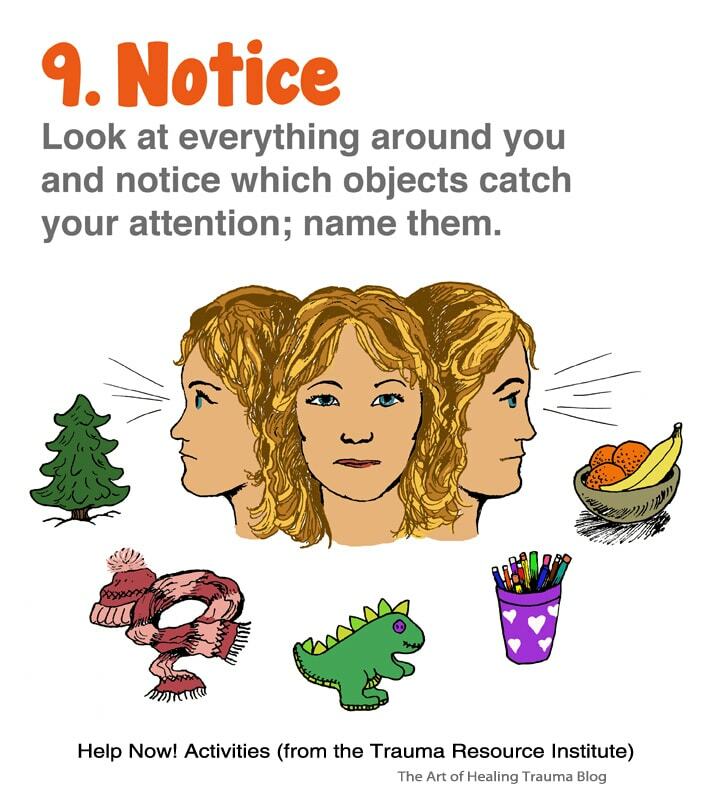 Activities are ten quick, simple, practical and easy to remember activities designed to get you back into the Resilient Zone if you need help now! because you’re either too amped up (high zone) or too checked out (low zone). 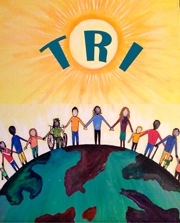 This helpful set of resiliency building strategies is taught in Community Resiliency Model (CRM) trainings. Here is the illustration for the art print I created giving the overview of all ten Help Now! Activities (more info about the art pint is at the end of this article). I highly recommend taking the CRM training which is open to any member of the public who wants to learn more about self-regulation and how to become resilient in the face of stress, anxiety and symptoms related to trauma recovery. In my experience of PTSD, during the last 9 years since the accidents (2007-2016) I was pretty much always stuck in the High Zone or in the Low Zone. If I didn’t appear that way it was just because I was masking it by controlling my behavior, but my body was still highly stressed – “buzzing” with stress – inside, and I could get easily thrown into the deep end if triggered because I was a “live wire.” I was also simultaneously in the low zone – blank, checked out, deeply and overwhelmingly tired, numb, invisible to myself, not “home,” paralyzed and unable to react to anything happening around me – like a blank piece of paper or paper doll. I can get triggered many times a day, so I never experienced the resilient zone very often until recently. Just last month I finally began to feel like I could fill some moments with feeling safe and relaxed and it didn’t take hours of work to do it but came a little bit more naturally. I actually have been able to feel that feeling of safety since I learned to do Somatic Experiencing in 2010, but it was difficult to achieve and just recently it’s been easier to achieve. So – what happens when we are bumped out of the Resilient Zone and into the High or Low Zone? The High Zone is when you’re experiencing hyperarousal or activation of your brain and nervous system. In the High Zone you may feel: nervous, anxious, panicking, terrified, hyperarousal, hyped up, amped up, hypervigilant, having a meltdown, tingling with fear, irritable, jittery, hyperactive, “out of your mind” which means very dissociated due to hyperarousal, floating, “losing it,” going off the deep end, feeling like you’re having a mental and/or emotional breakdown, freaking out, spazzing out, manic, buzzing, a live wire, angry, suddenly totally overcome with rage. You may experience shaking / shivering, shortness of breath, shallow breathing, flushed face, dizziness, headache, nausea, muscle tension, digestive upsets, like you could pass out, changes to vision or hearing, a feeling of not being in control of yourself. The Low Zone is when you’re experiencing hypo-arousal of your brain and nervous system. In the Low Zone you may feel: depressed, tired, sad, down, exhausted, isolated, disconnected, a sense of paralysis, not wanting to move, low energy, numb, flat affect (meaning no emotions), completely zoned out, checked out, spaced out, invisible, blank, unresponsive, stock still, frozen, immobile, confused, deadened, despondent, dissociated, unable to engage in what is going on around you, insomnia. When you return to your Resilient Zone, you’re calm but also alert. You’re not too nervous or angry, and not too depressed or checked out either. Sometimes we may go back and forth between high and low constantly, like being on a roller coaster. One thing I have noticed is that sometimes I have both high and low in my body simultaneously. The feeling I sense the most might be the feeling of being exhausted, for example, but if I tune in there is a kind of highly stressed feeling in my body at the same time on a subtle, almost imperceptible level. The Goal. The goal of doing these activities is to signal safety to the Survival Brain. Sensation is a Language. The Survival Brain understands the language of sensation. You communicate with it by becoming aware of sensations in your body. The Importance of Tracking. In some Help Now! 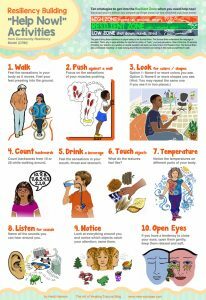 activities it’s important to put all your attention on, or “track,” your body sensations, so that you can communicate with your Survival Brain and let it know you’re safe. Twenty Seconds. Most of the time, 20 seconds of holding your attention on a positive or neutral sensation will reset your body to be in the Resilient Zone. During that 20 seconds of deep awareness placed on the sensation, your Survival Brain is listening and receiving the message that all is OK and it gradually reorganizes itself to respond to safety instead of danger. Neutral is Awesome. A neutral sensation is just as helpful to focus on as a positive sensation. Programmed to see Negative. We are programmed by nature to focus on negative sensations and experiences to survive them. So it can take a little extra effort to focus in on positive and neutral sensations. Sensation Words. Use sensation words (like “hot”), rather than emotion words (like “angry”). Orienting. The Survival Brain also understands “orienting.” When you orient, you really look around the environment around you – scan the environment – with new eyes, examining things you may never have noticed. This activity helps your Survival Brain understand that there is no danger, and this helps you come to feel inside yourself and inside your body that you are actually safe. Scanning the environment is hard-wired into us as it’s nature’s way for animals to orient to being safe. Where is that sensation located in your body? Helpful Quote: “When the alarm bell of the emotional brain keeps signaling that you are in danger, no amount of insight will silence it.” – Bessel van der Kolk, The Body Keeps the Score. Find someone willing to walk with you for a little bit. Or, if no support person is available, you can do this exercise walking around by yourself as well. Notice the feeling of your feet touching the floor or ground. What do the bottoms of your feet feel like? What about the tops? Is the ground rough or smooth? Can you sense how the pressure goes first on your heel and then moves to the front of your foot? Pay attention to your arms. What do they feel like swaying as you walk? Notice the feeling of your legs moving. Some sensations you might have: heaviness, pressure, swaying, breeze, air, friction where one part of your body rubs against another. Tell the person you’re walking with what sensations you notice. Stand facing a wall or securely closed door (one that won’t open if pushed on). Put both palms against the wall and lean your body towards the wall. Push against the wall and notice the muscles in your upper arms, forearms and hands. Pay attention to how they feel while pushing the wall. Push harder. Pay attention to how your shoulders and back feel while engaging your muscles. Pay attention to how your legs and feet feel, pressing against the floor. Let all the stress in your body go into the action of engaging your muscles and pushing against the wall. The recommendation is to focus on sensations in muscles because a lot of fight and flight energy gets stuck in the muscles, but you can focus on any sensation in your entire body as well. The idea is to be present with your body as it experiences the exertion of the act of pushing, and just “be with” it by placing attention on sensations that arise. Good areas to focus on is where your feet push into the floor and hands push into the wall, because these points also help ground you and connect you to the physical world around you. This is not an official Help Now strategy, but it does help settle and ground. Lean your upper back and head against a wall. Lean into it. Relax. 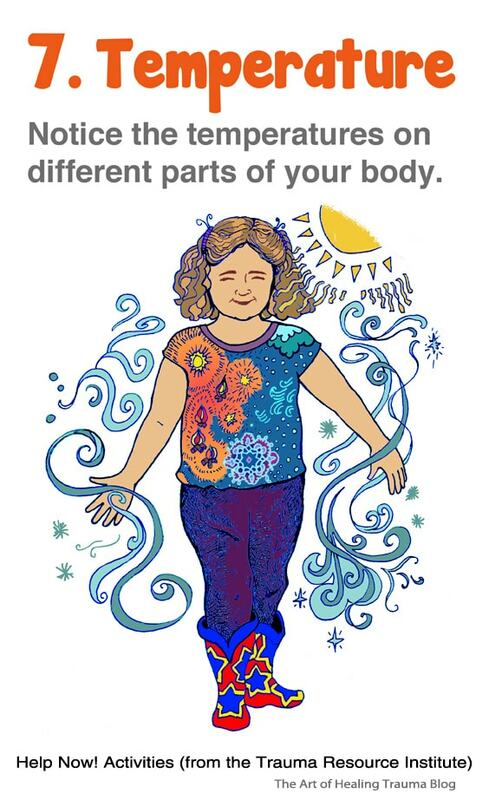 Sense how the wall and building are supporting your body. Press a little bit into the wall. Notice that you can see all points around you and know nothing is dangerous. Having a wall behind means you can orient to the whole space and nobody can startle you from behind, this can calm the animal mind. Look around. What colors do you see? It’s OK to name the same color more than once if you see it in more than one place. Keep naming colors until you begin to feel like you’re in your Resilient Zone again. 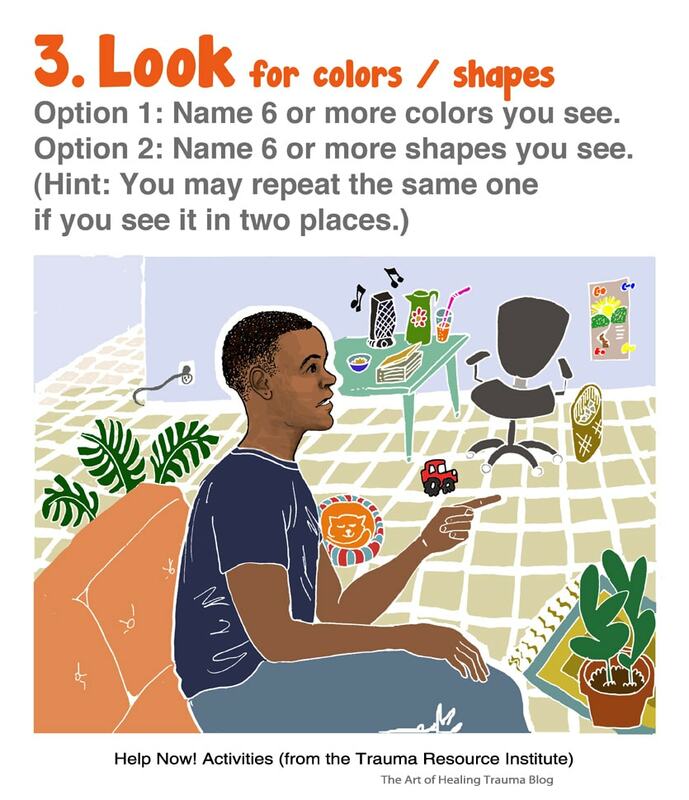 Make sure to look all around yourself for colors – near and far, up and down, right and left, in front and behind. This focuses your attention on physical things in the here and now. Also colors of objects brings your focus to mundane things that have nothing scary associated with them. Shapes. Instead of colors, name different shapes you see around you. Shadows. Point out where you see shadows in the space around you. Note – I added these 2 variations – they are not part of the official list from CRM. 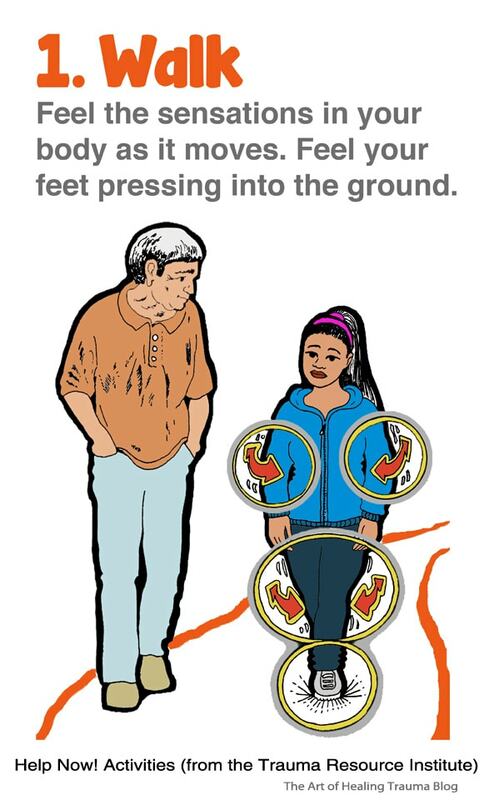 Ideally you should do this while walking around, but you can try it while sitting or standing and see how it goes. This one should be done according to counting ability. 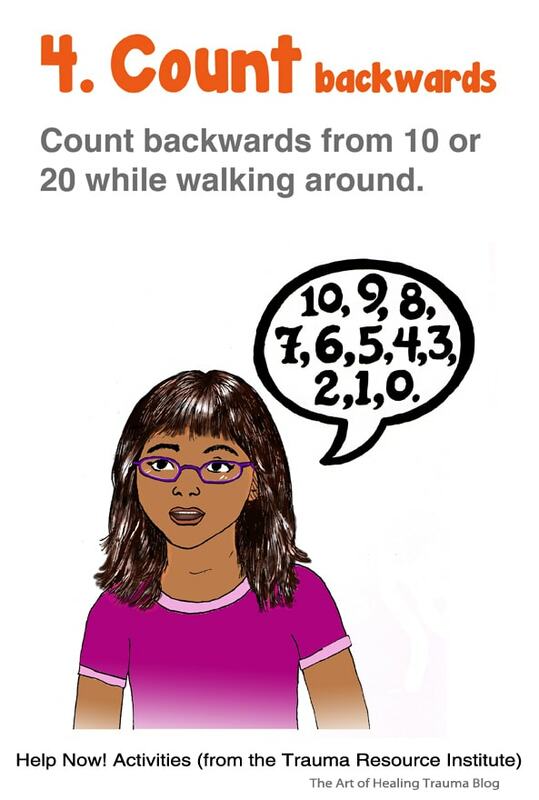 For children who know their numbers and can easily count down from 10, then begin at 10. For anyone who has already learned numbers up to 20, begin with 20. When you’re done, if you need to calm down more, just begin counting backwards again. Keep counting backwards from whatever beginning number you feel like until you are calm again. It usually takes 20 seconds of tuning into something that feels neutral or positive to “reset” your nervous system. In this case counting is a pretty neutral activity, so counting from 10 twice, or from 20, covering 20 seconds, might begin to return you to your Resiliency Zone. Get a cold drink of some kind like water from a refrigerator, ice water or water from a water fountain. Drink slowly and pay attention. What does it feel like on your lips? Tongue? Then swallow and see if you feel any cold going down your throat. If you don’t feel it that’s OK, just notice that you couldn’t sense it and just felt warmth. The noticing is the important part. Take another sip and again pay attention – what does the water feel like in your mouth? Does it make your mouth feel cold anywhere? If you have a room temperature beverage that is fine. 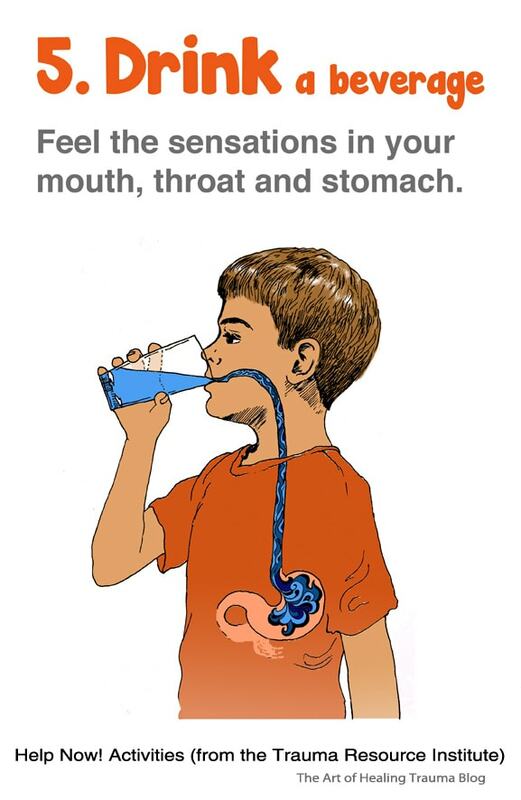 Just drink very slowly and feel the liquid in your mouth as you drink. Some qualities you might notice: sloshy, smooth, warm, cold, refreshing, flowing. 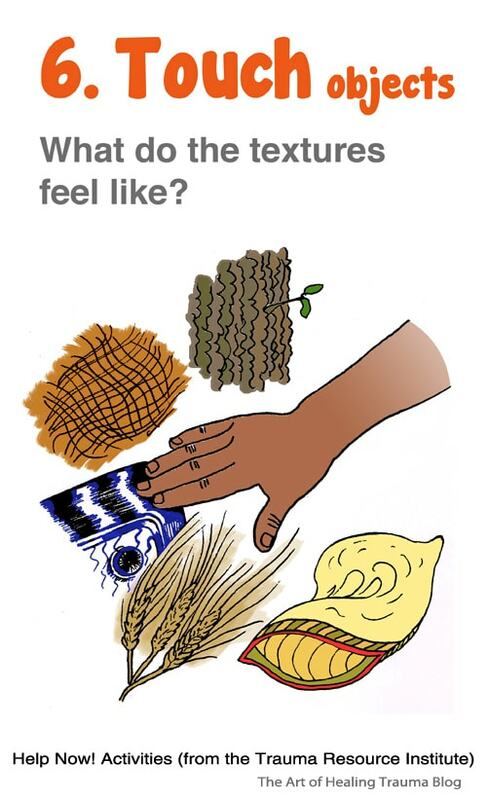 Touch different objects around you and notice their textures and characteristics. Some things you might notice: smooth, hard, soft , rough, tickly, cold, warm, irregular texture, spongy, ridges, furry, fuzzy. Does the air feel warm or cool to you, in general? Do you feel any air hitting you that feels cooler than the rest of the air? Do you feel any part of your body that feels really warm? How does your face feel in comparison to your tummy? Does one side of your face feel cooler than the other? How do your hands feel? Are they cooler than your feet? Are your feet cooler than the top of your head? Keep noticing temperatures until you feel calmer. Comparing two parts of your body can help you deepen your focus because you have to pay attention more when trying to figure out what the differences are. 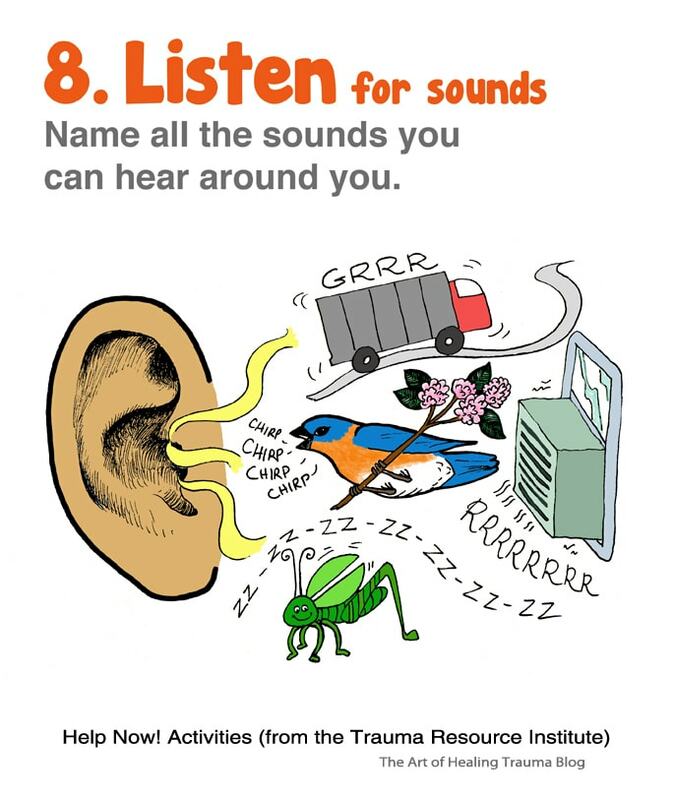 You may notice things like: humming, blowing, “white noise,” birds, car, crickets, low hum, medium hum, children playing, ticking, wind whistling, leaves fluttering, creaking, dripping, tree frogs. Name 6 or more sounds you hear. Look all around you and notice which things your eyes focus on. Which things catch your attention as you look around? Name them. 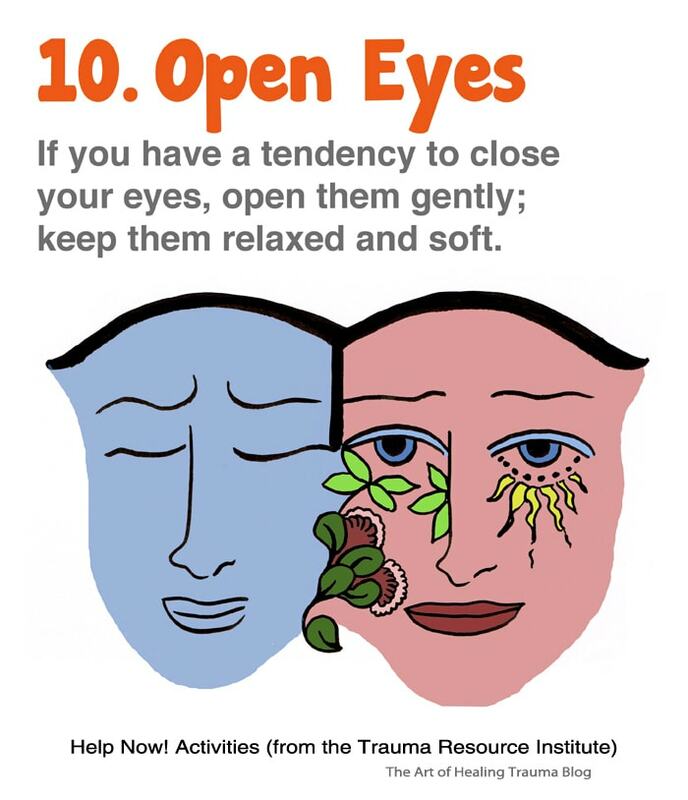 If you have a tendency to allow your eyes to shut in order to go into yourself and shut out reality, try opening them in a relaxed, soft way and slowly look around. Treat this as an experiment. For some people it helps their nervous system, for others it may not. Having your eyes open and available to notice if there is any danger around can tell the body that there is no danger. But if you open your eyes too big, it might make your body feel like you’re being hypervigilant which could make you feel nervous. This is just lightly opening your eyes if you happen to like to keep your eyes closed. Another thing to notice is that if you tend to be hypervigilant and watch the environment in a stiff, fixed, searching way for danger, you might want to soften your gaze and relax your eyes while still keeping them open. The idea is to let the outside world flow to your eyes while staying alert and aware. Note that the entire description of this is mostly my own interpretation of what it’s about. Please pass this article on to people who may find it beneficial. Thank you! And I wish you the very best in your healing of yourself and others.